At Home Health Care Plus, LLC our qualified care team takes pride in providing home care for you and your loved ones in the comfortable surroundings of home. Our three convenient locations, Market Street Philadelphia, Godfrey Ave Philadephia, and Delaware County, are here to serve you. Help is jut a phone call away! We offer quality services for those in need of professional home care, with around the clock services by our well-trained and friendly health care team of Registered Nurses (RN's), Licensed Practical Nurses (LPN's), Behavioral Therapists, Nutritionists and Certified Nursing Assistants (CNA's). Bilingual Speaking Aides from all nationalities. Non medical home care and much more! We currently accept Medicaid, Private Pay, Aging Waivers, Attendant Care Waivers, Act 150, Independence Waivers, Commcare Waivers and OBRA Waivers. To speak with one of our friendly representatives, call us toll free at 215-474-2273 for more information. 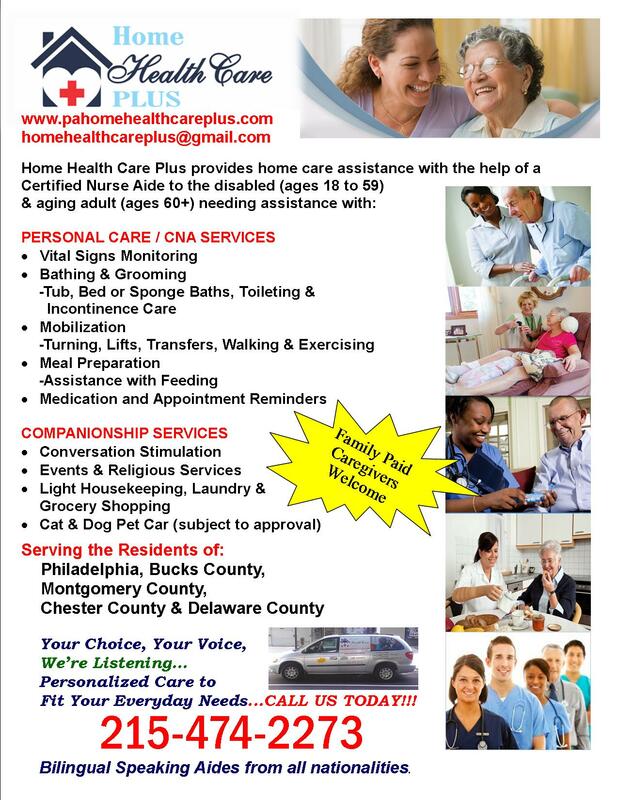 Home Health Care Plus serves the Greater Philadelphia area, including Philadelphia County, Bucks County, Chester County, Delaware County, and Montgomery County. Download our Services Poster and share with a family member or friend.